Embattled Rep. Anthony Weiner on Thursday announced his resignation from Congress after more than a dozen years, ending almost three weeks of media scrutiny and intense pressure on the New York Democrat who sent lewd photos and messages to several women he met online. "Today I am announcing my resignation from Congress so my colleagues can get back to work, my neighbors can choose a new representative and most importantly that my wife and I can continue to heal from the damage I have caused," Weiner told a packed house of reporters and others at the Council Center for Senior Citizens in Brooklyn. Weiner's wife Huma Abedin, a top aide to Secretary of State Hillary Clinton, was seen entering the couple's home in Queens before the press conference, but was not at the Brooklyn event that took on a circus-like atmosphere as many booed and heckled Weiner while he spoke for about three minutes. Others shouted at him not to resign. Abedin is in the early stages of pregnancy with the couple's first child. The scandal had become a distraction for House Democrats, who had raised pressure on Weiner to resign in recent days after he admitted to exchanging lewd photos and messages with women he met online. Even President Obama weighed in on Monday, saying that he would resign if he were in Weiner's shoes. House Democratic Leader Nancy Pelosi immediately sought to move on from the scandal. 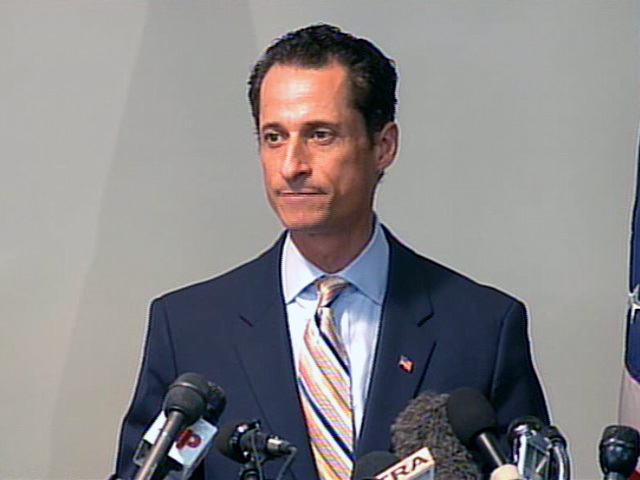 "Congressman Weiner exercised poor judgment in his actions and poor judgment in his reaction to the revelations. Today, he made the right judgment in resigning," Pelosi said in a written statement. "I pray for him and his family and wish them well," said the California Democrat, who stood by Weiner in the early days of the saga and turned on him within minutes of his admission that he had lied about his actions. Read more reaction to his resignation from his colleagues. Weiner's resignation sets up a possible special election for his replacement, though New York Governor Andrew Cuomo could decide not to call one. But that scenario is unlikely since there are 16 months between now and the next election. The saga began in late May, when he accidentally posted a salacious picture of his crotch in grey underwear to the more than 40,000 of his followers on his Twitter account. The photo was meant to be sent to a college student in Washington state. New details emerged in the following days, and the scandal got even stranger Wednesday, when a stripper who exchanged emails and messages with Weiner said he asked her to lie about their interactions and called for him to step down. Watch a slideshow of photos from the scandal.